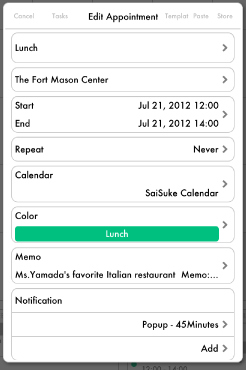 Tap an appointment, the detail screen of appointment will appear. You can edit or copy the appointment by selecting the icon at the top. You can see full text of the memo by tapping full view of memo icon. To make memo normal size, tap minimum view of memo icon . Map icon appears when there is a description of the location. 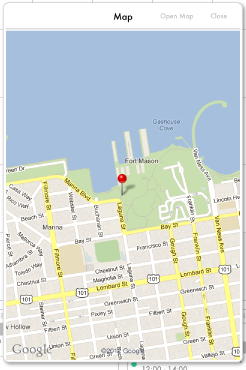 Map dialog will appear by tapping map icon. 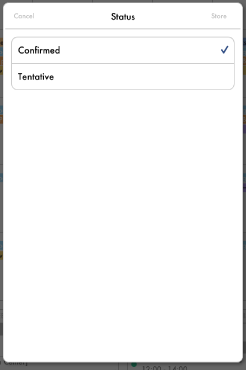 If you add an appointment to the template, you can add the appointment by dragging. You can copy the appointment. You can delete the appointment. You can edit the appointment. Link button will appear depend on the description. If memo contains a phone number, email address or URL, you can launch phone, mail or Safari by tapping. To edit appointment, select section to modify. 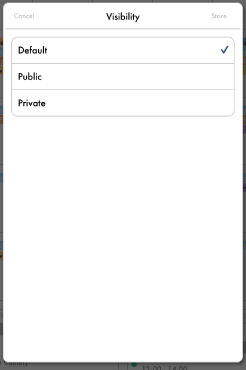 To edit title or location, you can select from history you used recently. You can also type with keyboard. 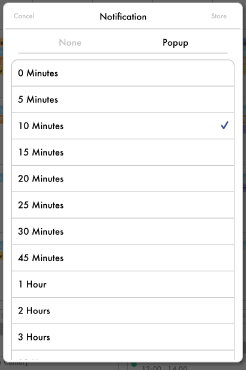 You can specify start and end time of the appointment by using the wheel. The end time will be changed in conjunction with the change of start time at default setting. You can also change the link at Input Setting. Slide to on for all day event. 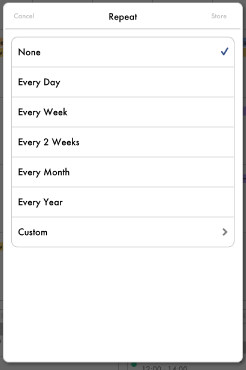 You can edit repeat condition of appointment. Custom pattern of repeated is also available. 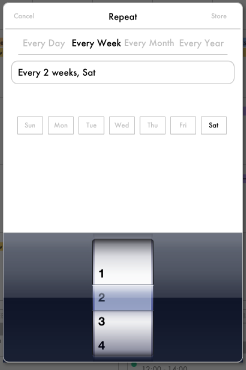 Select the calendar to store the appointment. 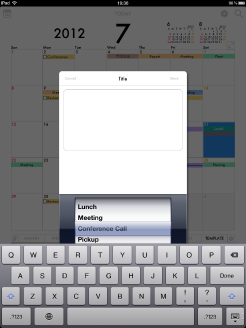 You can change default calendar by selecting the calendar and tapping "Update Default Calendar by *** ". 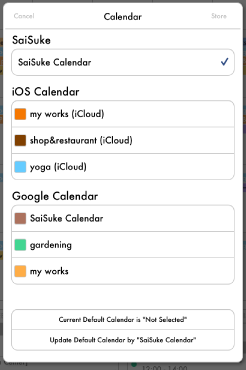 You can edit the appointment color of SaiSuke Calendar. 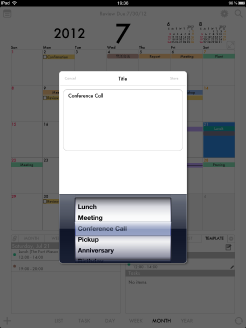 iOS calendar appointments are displayed with the color of the calendar unit. 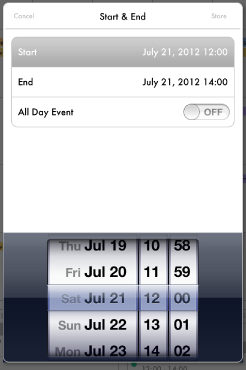 You can change the color at Override Calendar Color in Appearances Setting. Google Calendar appointments can be specified for each plan from among the candidates that are provided with the Google Calendar. You can not change that color. 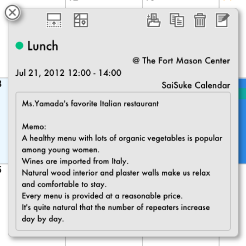 The detail screen of appointment will appear by tapping the appointment of Google Calendar. You can change the title color of each appointment there. This is color editing dialog. 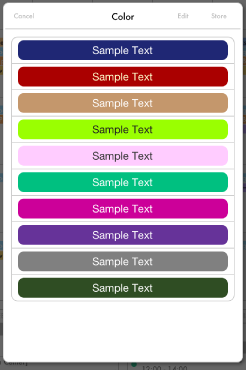 You can edit text color and background color individually. Text & Background at Appearances Setting looks slightly different, but the same color editing dialog is used. 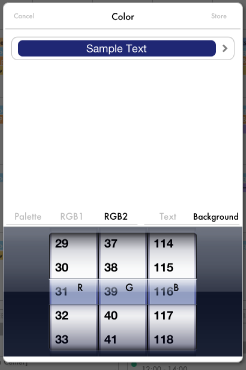 To configure the color, you can use three mode which is palette, RGB1, and RGB2. 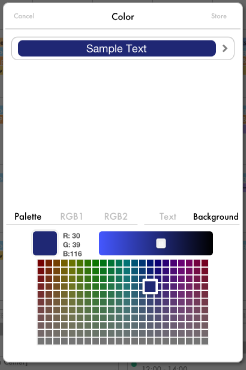 In the palette, you can select colors visually. 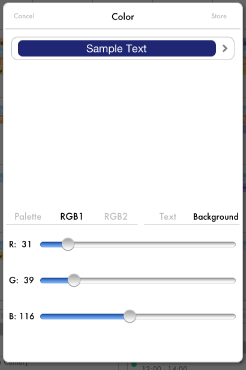 In RGB1, you can select a color by using the sliders. In RGB2, you can select a color by using the wheel. 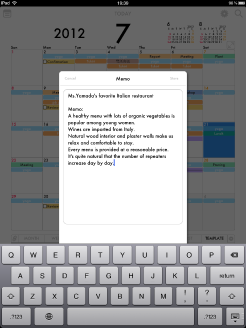 You can edit memo by using the keyboard. You can edit the notification of the appointment. To enable notification, you need to configure the system. Please check Notifications of iPad at Settings. SaiSuke must be In Notification Center. You can set alert style or sounds there. You can select visibility in Google Calendar. You can select status in Google Calendar.